The dark side is quick, easy and powerful. 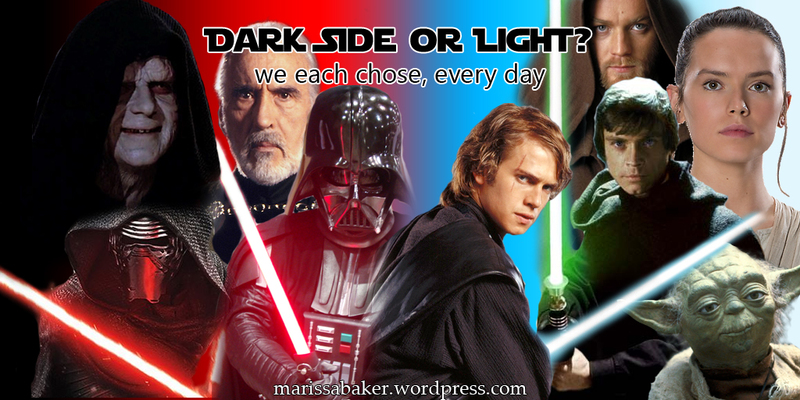 The light side requires commitment, bravery and peace. They are always at odds, always battling in the galaxy as a whole, between groups of people, and even within individual hearts and minds. Star Wars has always been about the classic battle between good and evil. This same battle rages in our world as well, which is one of the reasons this franchise is so popular. We can all relate to the humanity and struggles of the people in this “galaxy far, far away.” It’s a sort of myth or fairy tale for the modern age. And, like many iconic stories, it can prompt discussions about a variety of topics important today, including faith and religion. In Star Wars, the Dark Side is the “quick and easy” path, just as in the Bible the path toward destruction is wide and easy to find. Darkness has a strong, seductive pull which actually mirrors an analogy in Proverbs where evil is compared to a crafty harlot while wisdom is a gentle, godly woman. Like the Bible, Star Wars teaches the Dark Side isn’t better – the good characters resist it and win, the bad characters find that it ruins their lives and the lives of those around them. Nowhere is this seen more clearly than in following the life of Anakin Skywalker chronologically, as I did when rewatching Episodes I through V with the Clone Wars series. Setting aside for the moment things like Jar Jar Binks, lackluster screenwriting, and convoluted Jedi logic, the prequel trilogy plus Clone Wars is a compelling story about a man with enormous potential who fell from the light. Anakin could have been one of, if not the, greatest light-side users ever, yet that also came with the potential to be one of the most powerful dark-side users ever. He was impatient and fearful, and he took the easy way out so he could gain more power quickly. As usually happens when we step out of the light, it doesn’t work as well as the snake in the garden promised. Anakin loses the very people he intended to protect, as well as the physical loss of his arms and legs. For him, the consequences of sin were immediately visible and there was nothing he could do to reverse it. He didn’t even try — he just sank deeper and deeper into his chosen hell. Darth Vader’s redemption is a key plot thread in the original trilogy. We can compare Luke’s persistence to bring his father back from the darkness to the desire we should share with God that none should perish, but all should come to repentance. The fact that Vader was able to come back to the light after doing so many terrible things makes me think of Christ’s parable in Luke 7:40-50. We tend to think of some people as having sins too big to repent of, yet Jesus tells us that the one who the Master forgives the most will love Him the most. I’m not staying Star Wars is perfect, or even that it’s an allegory. Just that in most good stories which follow a light-verses-dark struggle (Lord of the Rings is another example) we can find parallels with our Christian walk. 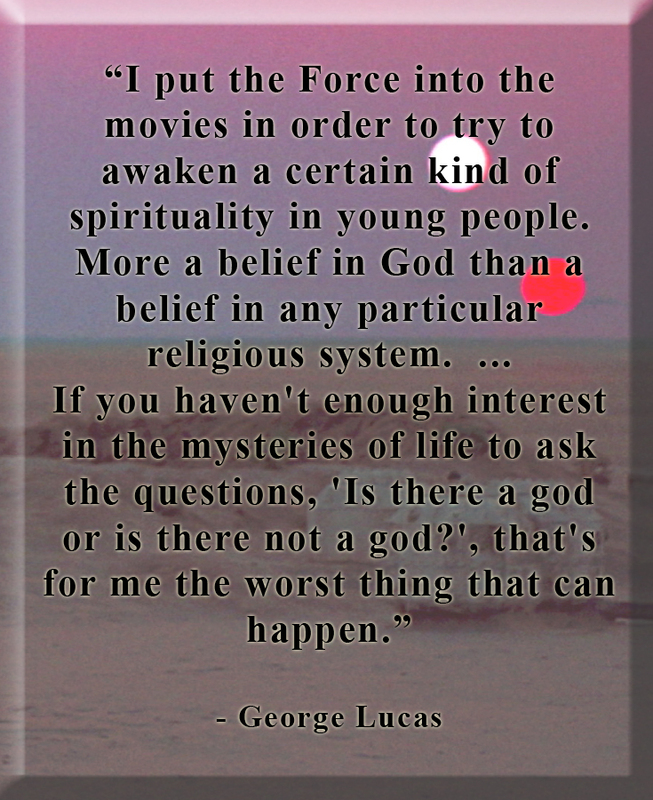 In a fascinating interview from 1999 titled “The Mythology of Star Wars,” Lucas talked about crafting Star Wars from common threads in mythologies and religious stories world-wide. Lucas also said that just about every religion has at some point used the original trilogy as an example to illustrate their faith. It was never meant to offer an alternate religious construct or represent a specific real-world faith, but rather to inspire viewers to search in their own lives and worlds for greater meaning — to make them think about the deep questions of life. I love that Star Wars can generate discussions and prompt us to think about the struggle of good-verses-evil that’s going on inside each of us everyday. No matter what your faith, you have a decision to make every day whether you’ll walk on the dark side or in the light. Another excellent and thought-provoking post Marissa. And we now have an illustration of what happens when someone is convinced to enchain HIMSELF. To believe redemption is impossible. That is what Snoke has done to keep Kylo Ren imprisoned: convinced him to put the restraints on himself. The one way Kylo Ren can come back is by realizing this deception, and that the power to choose is still his. There’s definitely a Christian lesson in there. Oooo, I hadn’t thought about Kylo’s character in quite that way yet. I find him the most interesting of the new characters, partly because of that struggle between Dark and Light and partly because he’s different from other villains we’ve seen. Really looking forward to seeing whether he gets a redemption arc or keeps shackling himself to the Dark Side. Now you and I believe in divine aid in such situations, but we are asked to make a choice and to believe that we are empowered to do so.